On the day of the brew, we were a little late in getting started; we had intended to start at noon but we were still getting things together and determining the grist to water ratio until about 1pm. At 1pm, however, sanitizer was in the brew bucket and fermenter, and the water for the mash was on the stove. We find that using two burners works pretty well so we don’t need to use a propane burner. This is a good tip for you kitchen brewers out there. Following the advice of Charlie Papazian, I decided to relax and have a homebrew. I popped open our IPA that we brewed approximately 4 weeks ago and was pleasantly surprised by the results. It came out really nice! We did a hop tea where we threw some hops into the pan of boiling water and priming sugar and added to the fermenter immediately prior to bottling. This added a really nice floral aroma; the beer was pretty heavily hopped, which is how I like it! We heated the water in the hot liquor tank (aka the pot on the stove) to 167 degrees and added three quarts of water to the mash tun. We then added some of the grain, and then more water. We staggered it like this to hopefully avoid getting doughboys (e.g., clumps of grain that would need to be broken up). This worked pretty well; we didn’t get any doughboys. The one thing that did go wrong was that the water did not retain the required temperature when we added it to the mash tun; we had to add additional hot water to the mash tun to try and achieve the desired temperature. When we brew again, we will heat the liquor to a higher temperature prior to adding it to the mash. Eventually we were able to get it to our desired temperature of 152 degrees but we had to go over our original one-to-one grist-to-water ratio. Luckily, Brad and Jason from Spiteful Brewing stopped by to help us troubleshoot. They also brought over some of their beer, which is always a welcome treat. Then the waiting game began. We had an hour to kill while we waited for the mash to finish so we watched Kung Fu movies and sampled beers. That hour went by quick! Once the hour was up, the recirculation (where you run the grainy wort a few times until you get a clear liquid) went fairly quickly; we only had to run it off three or four times. And we didn’t get a stuck sparge or anything! All in all, it was a very smooth, unintimidating process. What was I worried about? We are pretty adept at the rest of the brewing process by this point so we could relax and just enjoy the rest of the day. This is the time when some more friends started arriving. Dan, a fellow member of CHAOS homebrew club, stopped by. I had put this event on the CHAOS website with an invite for all Chaos members. Dan is quite the accomplished brewer, and uses a system I have never heard of before! 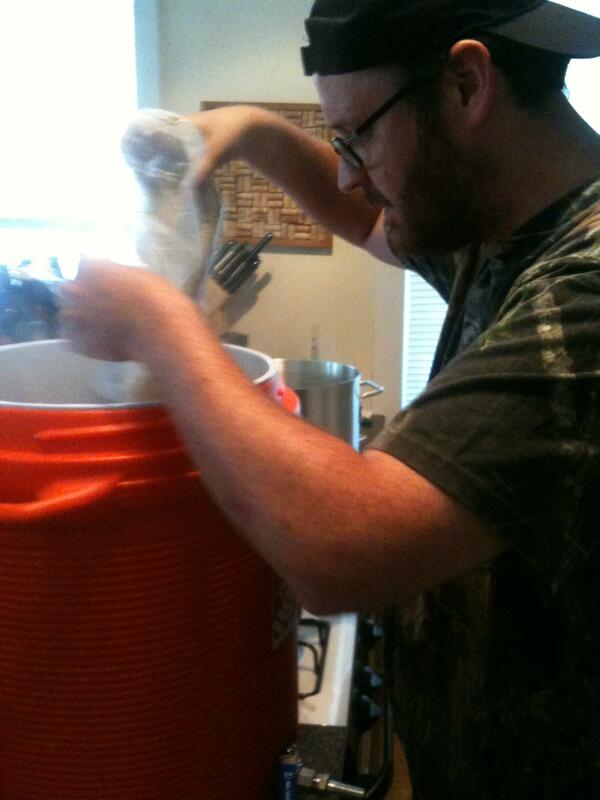 Instead of using the standard converted cooler as a mash tun, Dan uses the “tea bag” method. This, he described, involves using some curtains he acquired from Wal-Mart, putting the malt in the curtain to form a “tea bag,” and steeping it in a large pot of hot water. I can’t even go into more detail as I have no idea how this would work. But it does! He brought over three or four different beers – all German style lagers – and they were delicious! I especially liked the German Pilsner which was biscuity and slightly spicy. It was a great example of the style. I can’t wait to try more of his beers! We finished the brew day around 7pm; we made pretty good time, if I do say so myself. There is absolutely nothing intimidating about all-grain brewing. If anything, it was more fun and I felt like I had more influence over how the beer will turn out. We had so much fun that we are planning on doing another brew over Labor Day weekend. I know that as we get more into brewing and experimenting with more advanced styles that we will probably encounter some issues. But now I know we will be able to handle it. Can’t wait until the next brew day! The beer was not only fantastic it was great to see the passion and dedication displayed by the new up and coming brew masters though I’m sure they would never admit to being brew masters but a hint of watching ku fu masters while the true masters are at work is justification for me. Thanks for the comment, Charles! You are so sweet! It was great seeing you on Saturday! 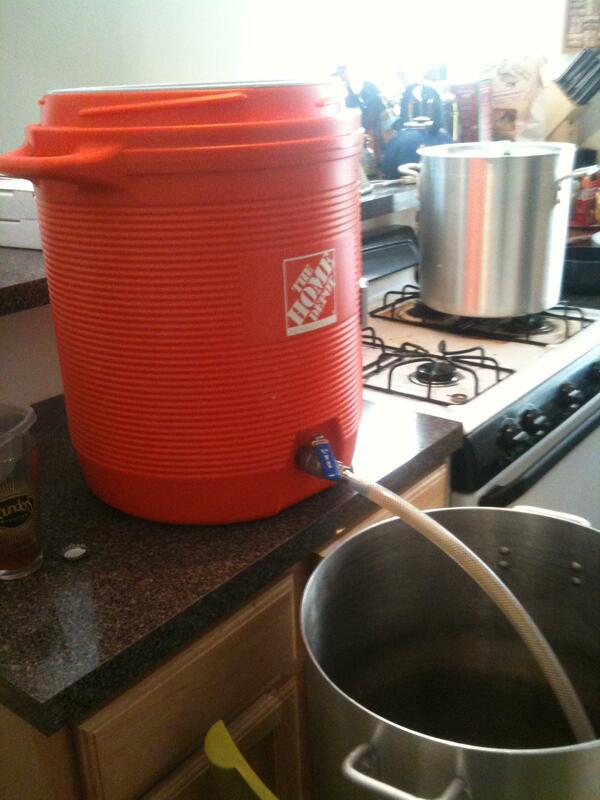 Congrats on your first all-grain brew! Let us know how it turns out! Thanks! It turned out really well, actually. 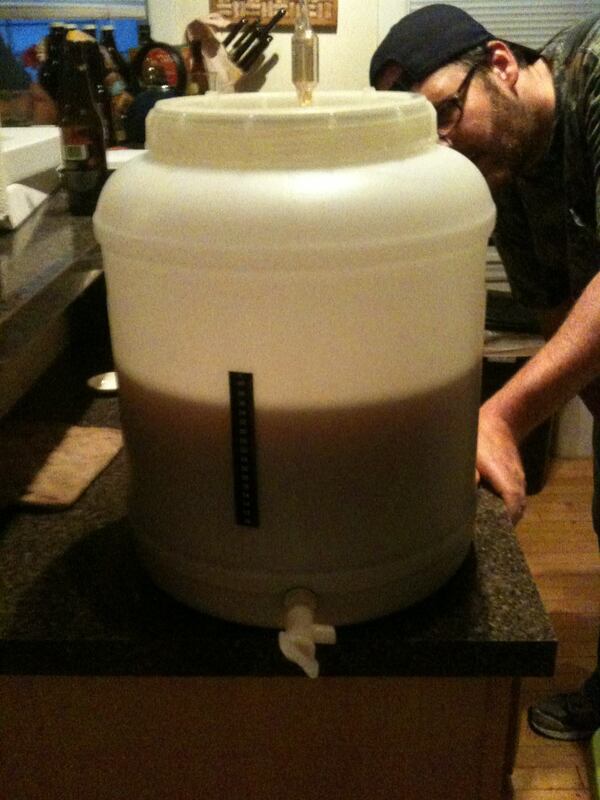 We also experimented a bit by taking two growlers worth and dry hopped it and added tea. Both versions turned out great, if I do say so myself. We brewed another batch and it will be served at Ides of Cider. You should come!